If you’ve started your interview preparation, you’ll know that NHS hot topics are a key part of a medical school interview. So it’s important that you know your news! 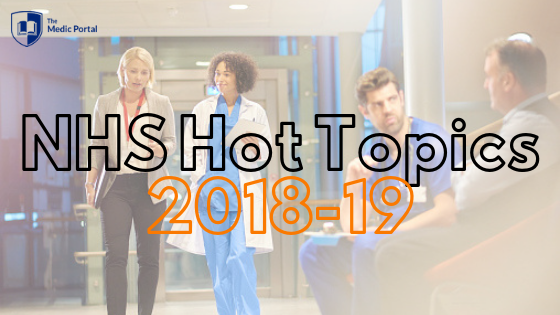 This page will recap a couple of key medical hot topics for 2018-19. This is by no means exhaustive, just a selection of big news topics in medicine, including: the junior doctor contract, the Bawa-Garba case, artificial intelligence in Medicine and the impact of Brexit on healthcare. What will I be asked about current NHS issues? What’s your opinion on the junior doctor contract? What role do public health campaigns like anti-smoking TV adverts have in the NHS, and why is this a good way to spend NHS resources? Is mental health an area of concern for the NHS, and if so why? Do you agree that people should be charged for attending A&E with non-life-threatening ailments? How can I revise NHS Hot Topics? Make sure you’re up to date with current NHS issues – any recent developments in medicine and issues causing debate or controversy. At The Medic Portal, we publish a weekly news summary – you can sign up to get these delivered straight to your inbox here! If you attend our Interview Course, you’ll also be given a copy of our Interview Course booklet. Over 22,500 words, it covers 22 NHS Hot Topics, including: the Junior Doctor Contract; the five new medical schools; GP services and primary care; the ageing population and social care; mental health; the Charlie Gard and Alfie Evans cases, and many more – so you’ll be all clued up for your interview. Where can I read more about current NHS issues? Our NHS section covers many different challenges facing the NHS, including the ageing population; evolving healthcare needs, such as the increase in cases of obesity and diabetes, or antibiotic resistance; closure of local services due to centralisation drives and an increase in reliance on privatised services.